It is always so weird when something you have imagined actually comes true. As usual, it was way better than the imagining, way more emotional, way more fulfilling and way more fun. Yesterday, Jack graduated from high school. I truly don't know how that happened since my own memory of graduating from high school is so vivid: holding my dear friend's hand and saying,"I'm not ready to graduate. What can I do? How can I stop the train?" No luck. The train had already left the station and we were on it. He walked across the stage and they said his name. We cheered wildly and with abandon. We cried at the valedictorian's address and his sincere thanks to his parents, specifically his dad who could not be there. We sadly remembered the parents who did not get to see this day and hugged and cried in relief with the parents who feared their child might not make it to this day. We watched Jack move through the throng of red robes, smiling and posing like a celebrity. We flashed back to our Christmas baby, our curious toddler, our artistic preschooler, our angel in the Christmas pageant, our soccer, basketball, baseball, karate and finally our volleyball playing kid, our Calvin and Hobbes fan, our tentative driver, our passionate homeless advocate and Rosebud Indian Reservation worker and our Relay for Life team captain. Here he was: Jack on the brink of something new saying goodbye to something he loved: high school. At his side were his siblings, his parents, his grandparents and his uncle cheering him on, savoring the moment. Waiting at home were even more family members, cousins, godparents, dear friends (more like family than friends) and even that old faithful high school friend of mine. Waiting to celebrate, cheer and congratulate...waiting to share college stories, waiting to ask questions, give gifts and high five. They are The Village. The ones who are there in the darkest hours. The ones who bring coffee, dinners, friendship and hope in the trying times. The ones who phone you and text you. The ones who really care about your kid..who celebrate the victories and cry and worry or sigh along with you when it isn't working according to plan. They are the net and when we fall, they catch us. And how do you say thank you to The Village? How do you watch the love and the support and the encouragement and not wish that every single child were wrapped in this cloak of love and acceptance? How do you not cry over the abundant gifts that have been given to your son by The Village? Let me tell you clearly: the surest way to my heart is through my child's. Watching my friends and family support and love him on this day was almost too much. I am grateful beyond measure for the privilege of being a mom. The whipped cream frosting is that I get to share the journey with this group who shares my days, my genes or some great stories. They make it a celebration and a marker in our family's history. Today we have a new story: remember when Jack graduated and it stayed sunny until we got home and then it poured buckets? Remember running for the food in the rain? Remember the cousins playing dress up and soccer and falling into the family comfort zone that just flows after a few hours of being together? To The Village: Thank You! Thank you with all of my heart for your love, support, kindness and celebration this week-end. You are the cherry on a really beautiful cake, full of whipped cream frosting and a whole lot of love baked eighteen years ago in a hospital room at Christmas time. I love you. There are those that enjoy music, move to the rhythm when they feel it and smile when an old favorite comes on the radio and then there are those whose very sustenance is music. It feeds their souls, melts their cares and moves them like nothing else. Patrick would be in Group Two. Music has always moved him and been a great equalizer. One of my favorite memories from Kindergarten was when Patrick's teacher unintentionally played Louis Armstrong's "What A Wonderful World". Patrick, who was getting antsy on the rug, suddenly perked up. He started doing the signs for the song and his teacher couldn't help but notice. She stopped to ask: "Patrick are your signing this song?" His smile said it all. For the first time, Patrick had something to offer to the other students and the paradigm shifted ever so slightly. Patrick could be the expert. He could teach something. Music was the bridge. When he was filled with chemo and feeling extra crappy, music would actually be healing for Patrick. At his lowest, I would hold him and show him a music video on the computer. Sometimes he would find some energy and dance ever so slightly. Mostly, he would just listen -- the warm, soothing notes wrapping him like a blanket. For me, music has always been a nice part of my life but in those moments, I learned the soul nurturing, life affirming strength in music. It was only natural that music and dancing would become Patrick's favorite after school activity. His happiest time of the week is, without a doubt, his two hours with Miss Mindy. Mindy has music overflowing out of her heart too. She formulates shows, choreographs dance routines, imagines whole productions for school-age kids that allow every single participant to shine. She is creative, imaginative and kind. She knows how to support the timid student who doesn't yet believe this whole performing thing is possible. She knows how to challenge the truly gifted vocalists. She knows how to include the outsiders and how to model the most important musical life lessons: pay attention, sing clearly, work together and be kind. For Mindy, the students are center stage -- the actual performance comes together in a beautiful, subtle way The costumes are casual and comfortable. The background is exactly that, in the back decorating but not overpowering. The music is not too loud or too important...it's the kids that matter. Everywhere, woven into every song, is this message: you matter. You are important. You sparkle. It's your chance to show the music in your heart. Go for it! Mindy agreed to have Patrick in her summer session when he was just a little third grader-to-be. I had no idea how Patrick would do but Mindy was ready. It turned out that her scripts became a part of his body at home. He wouldn't put them down: reading and re-reading them. Singing the songs, all of the songs, everyday became a part of our household background noise. During the class, Patrick paid attention, received just enough support and was held to the same high standards as the rest of the cast. He thrived. During the performance I was transfixed...how did he learn all of those dance moves? How did he know all of the songs? How could he remember when to come on and off the stage? The short answer: Mindy. For the rest of the school year, whenever Mindy offered a class, Patrick was all over it. The next summer, the production was Camp Rock. Because he had been doing it all year, I naturally thought this performance would be easy. Of course, because I thought it would be easy, it became difficult. Every single day of the camp, Mindy and I would brainstorm ways to help Patrick succeed, but every single day Patrick seemed to think of another behavior that would be interruptive and distracting. Day five, I was done. I looked at Mindy and uttered the unthinkable: maybe Patrick should just quit. I will never forget her resolve, her stamina and her unbelievable generosity. She looked at me and said, "Beth, I don't think that's the answer. What kind of message does that send to the other kids? Let's just let him do his song, see how long he can last and then you can pick him up early if he needs it." Patrick did indeed perform in Camp Rock. He made it over the hump and onto the other side. This past Saturday was Patrick's eighth performance with Miss Mindy. It was Popstar -- a series of pop songs and dances. Patrick chose a Jonas Brothers song and practiced and practiced. He was responsible for an entire song -- a first for him. The lyrics went back and forth to Karen, the speech and language goddess. Patrick memorized the whole song and at 6:30 am I was greeted by Patrick in full costume ready for his 7 pm performance! :) That night, he sang his entire song clearly. In the back, you could hear Miss Mindy singing ever so softly, offering that support, guiding and teaching but Patrick, like the rest of the cast, took his moment to shine and enjoyed it. In true Popstar fashion, he ended the song with a hair swish and bowed his way to his spot in the back row. How do you thank someone who opens up a world for your child that they never would have known? How do you acknowledge that their passion has rippled so far out into the world it has ignited a passion in another? How do you ever come close to thanking someone for a gift as profound as music? Miss Mindy, Breanne and Lindsay, together you have created a little bit of magic in the world and sprinkled it with your own personal sparkle. I can't thank you enough for opening your hearts and letting the music spill out. You are most certainly our bit of grace each week. "Music speaks what cannot be expressed, soothes the mind and gives it rest, heals the heart and makes it whole, flows from heaven to the soul." It flows from heaven to the soul...no doubt. Oh, the beauty of the ordinary day! I know I treasure ordinary days so much more since Patrick had leukemia...a day NOT in the hospital, a day NOT focusing on fevers or weird symptoms or reactions to chemo... a day where everyone is home and busy living a regular old life. To me, that is a slice of heaven. But lately, my ordinary days have been filled with one big event after another in such a way that it feels like the dominoes falling one after another at an astonishing rate. They fall so fast that it is hard to appreciate their perfect positioning, their colors changing, their incredible design...all I can see is a blur. Today was another one of those blurry days and I need to write it down, if only to savor it and get the chance to look back on the domino spill and see the intricate pattern and the beauty within what looks to any outsider as a giant mess. Today was Caroline's birthday. That alone would make this day full of sunshine and joy. Remarkably, her birthday fell on a school day (she only goes three times a week) and so today was also her "Special Day" at school. This means that for one day, preschool was all about her. She created the theme, Popsicle Day, and many activities centered around it. She was the Guest Teacher. She chose the morning song and the book to be read at Circle Time. She wore a crown and the crowd sang to her. She was honored, cherished, and celebrated just the way every single person on the planet should be and in truth very few ever are. I love the way her school takes the time to do this. It costs no money. It really doesn't change the school day at all. It is a very clever way to make one student feel important, noticed and appreciated for their individual beauty. Most importantly, that boost lasts. Conversations for weeks and months follow about that Special Day. Because this is Caroline's last Special Day at DCCNS, every single part of the day seemed extra bright for me. The parents stopping and wishing her a special day, the kids following suit. The crown, hand-made by me at our first parent meeting in September, brought out and worn with pride. The red chair, the sign out front of school informing the world of the Special Day. All of it made me appreciate this little haven once again. How blessed my girl is to have gotten this start to school. How blessed I am that these strangers in the beginning, now are friends and have grown to appreciate my child and treasure her too. After the parent meeting Caroline and I rushed home from school, took Buddy for a quick walk and headed off to Patrick's school. Today was my last day to teach art with Patrick's class. I have been teaching art once a month to these kids since they were in kindergarten and pregnant with Caroline. So it only seemed fitting to have my last time with them be on her birthday. Hand in hand, Caroline and I walked down to school, found the paints and paintbrushes we needed, popped the masks off of the molds we used and headed down to the classroom. A few days ago, the fifth graders used paper mache over a mold to create masks. We learned about all the ways masks have been used in different cultures. We saw examples of masks form all over the world and even had a mask from Mexico that the students could look at up close. Our theme for the lesson was the wisdom from Miss Frizzle, the unusually creative teacher from the Magic School Bus books. Her words: 1) Take chances 2) Make mistakes 3) Get messy! For me, that is a good motto for life and fifth graders are just beginning to see the benefits to playing it safe, staying clean and avoiding failure. I wanted my lesson to be a little counter cultural. I wanted to plant a few seeds that maybe mistakes aren't so bad, that taking a risk might be worth it and that getting messy is way more fun. Happily, they dove right in to the paper mache and held nothing back. They got creative, focused and enjoyed the process. Watching them quietly each in their own world smoothing the newspaper with the starch, I remembered their cave art from kindergarten, their Thiebaud inspired ice-cream cones from first grade and the many, many days I was privileged to share an hour or two in their classroom with them. This group of students has been the first group in our school to have a child with a disability right alongside them learning. They have shown time and again what a beautiful group of people they are. They are remarkably inclusive -- helping each other and reaching out. They are tolerant, patient and super smart. I see them as the pre-adolescents they are today and can't help but notice the shadow of the innocent wide-eyed kindergartener that they were just a few years ago hiding behind their wiser eyes. They have embraced Patrick and I forever hold them close for that. They have put up with my art ideas and welcomed me with enthusiasm for years. I will miss them but I will pass the torch of art education to a real artist and a fantastic teacher and I will work alongside of her, glimpsing the teen-agers-to-be now in junior high. I didn't have too much time to linger or get nostalgic. There was paint to clean up, brushes to clean and masks to find a home for. Once we got home, I wrapped a few gifts for Caroline and made my peace with the idea that a perfect birthday dinner was not in the cards for my birthday girl. Why? Because in addition to Caroline's Special Day and Patrick's last art lesson, today was also the semi-final game for Jack's volleyball team. Winning this game would put them in the championships for the whole region. Tonight's game was a bitter match up. Many of the players knew one another from playing club ball in the off season. Several of the guys from the other team would be playing volleyball in college and were bitter that Jack's team had beaten them during the regular season. They wanted redemption and they were gunning for them. It was going to be a battle. The starting line up of Jack's team was made up entirely of seniors. They had worked for four years to get to this point. 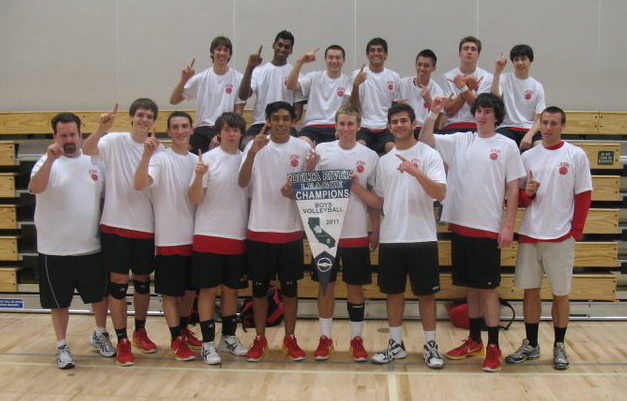 Jack, the starting setter, hadn't even made the team as a freshman. He was a "freshman manager" meaning the coach saw something in him that had potential but he didn't want to give him a spot on JV. He had the chance of going to practice with six other "managers" and playing side by side the JV but having only one or two games all season long. He took it and loved it and knew that volleyball was going to be a life long love. He played club ball in the off season and drastically improved. Three years later, he was the one calling the shots on the court, setting the hitters up for crushing spikes and serving up a series of unanswerable serves. Tonight would be huge for him. We decided to attend the game as a family, even though it would be a late night for Patrick and Caroline. Just before we left, we sang Happy Birthday to Caroline and watched her open her gifts. We threw on some red and gold and headed out. The tension in the gym was already noticeable as we entered. Blissfully, Patrick and Caroline opted for a snack bar hot dog, some raisinettes and cheetoes for a sub-standard birthday dinner...something's got to give on days like today! The other team came out roaring and before we knew it, we were behind by five points and giving serves away. Our side was quiet and their side was dominant. Spikes hit inside the ten foot line. Our blockers missed. Our serves went in the net. We were listening to their trash talk and we weren't answering back. At one critical point, Jack was up to serve. Patrick was cheering with gusto and to me it sounded like he was saying, "Jack, you're the greatest!!!" I was touched. I leaned over and said, "Patrick, it's so great you are cheering, are you telling Jack that he's the greatest?" He looked over at me with a doubtful expression. "No, mom, I'm asking him: Do you believe in fairies?" I busted up. Hopefully, by now, you know of Patrick's intense enthusiasm for things having to do with Peter Pan. It was classic Patrick...here, at this intense, critical moment Patrick was reminding Jack of the magic available to him. If you just believe, it can happen. I couldn't stop laughing and the question/cheer became mine for the rest of the night. Over the din of the crowd, together Patrick and I asked, "Do you believe in fairies?" We whispered it to each other. We looked knowingly at each other when something magical happened on the court. We knew that a little fairy dust could go a long way. And, yes, it did. Losing game one only solidified Jack's team's determination. They fired up. They hunkered down...diving, jumping, spiking, digging up impossible balls and leaving it all on the court. They won the next three games and Caroline learned to count to 25. She had her fair share of cheering and snacks. Together Patrick and Caroline rushed the court when the final point was scored. Jack had a fan club and two adoring fans who wouldn't leave his side. It was awesome! And then in a matter of minutes, just as quickly as it had begun, the net was taken down, the gym was emptied out and our family of six went out into a rainy night. We were worn out and enthused but filled to overflowing with a gift of another ordinary day. May it always be so. May is "Better Speech and Hearing Month". Who knew? Ten years ago, I had no idea. Then I met Karen and the other miracle workers in her office and discovered the transformational world of speech and language pathology. I often fantasize that if I had it to do over again, I would become an SLP (code for speech and language pathologist). Until I met Karen, I was clueless. I didn't realize that someone could actually exercise their mouth, tongue and lips to strengthen them so that the sounds that came though that larynx could be more recognizable. I had no idea that it could be a vocation, a life's work, to give someone through hard hard work their voice. But that is exactly what Karen does day in and day out. Patience must be the cornerstone of every SLP because they measure their victories in the smallest of ways: a new sound, holding the bite stick 5 more seconds, jaw position, lip strength and an observation of growth no matter how slight. Patrick met Karen at the ripe old age of two. I was frustrated that he wasn't making more sounds, worried that he would never clearly be able to articulate his needs, and so, so curious about the thoughts behind those bright eyes. Karen was unphased by Patrick's lack of speech. She took him back to her tiny office and kept a two year old engaged in activities that seemed like playtime but were truly hard work. He held pretzels between his lips, moved goldfish crackers on his tongue, blew out candles and worked on following directions. Karen was warm and engaging. She meant business and didn't fool around. Every single session Patrick was working, he just didn't know it. 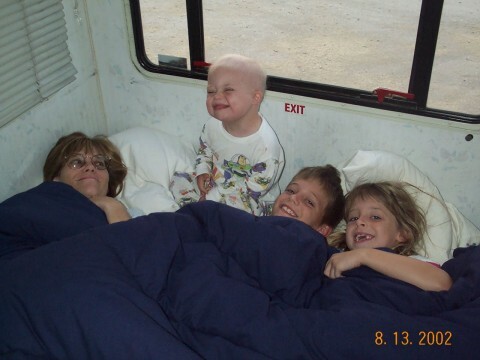 When Patrick was diagnosed with leukemia, the only person we continued to see was Karen. She washed her hands and kept going. The continuity of Karen, even when he was feeling horrible, was a comfort. You see, Karen is fun! She plays music, brings out the balloons, and makes you excited. She is a detective. She carefully watches and analyzes your growth. She knows what makes you smile and how to encourage you in just the right way. Just when you think you've figured Karen out, she changes it up and brings out a new game, a new idea or a creative new activity. She pushes you and expects the most from you. She usually gets it. When Patrick was five, I was frustrated by his lack of real language. His language had grown but he still couldn't say Jack clearly (it was "naa") or Mary Kate (she was "nis" for sissy). Honestly, I just never thought it would happen. Karen had her eye on the prize. She knew the roadmap. She followed it. She was calm when she told me: "Beth, J and K are some of the very last sounds. They are at the back of the throat. It will happen. We are getting there." Her knowledge, natural curiosity and buddha-like patience became my inspiration. I vividly remember the day Patrick could tell me that he had bagels for snack time in preschool. I couldn't stop smiling. He had bagels and he could tell me!!! Suddenly, I wasn't frozen out of knowing what happened during the time that I wasn't with Patrick. He could give me some of the story. Kindergarten came and went and we noticed a phenomena: the more that Patrick could read, the better his speech became. The visual support of reading also became a support for his language. It was wild. It was like watching a mystery gift with seven different layers of wrapping paper get unwrapped one layer at a time. Patrick's voice, his thoughts, his abstract ideas slowly started taking shape. Listening to Patrick read out loud is still one of my greatest joys. The many, many subskills involved in breaking the code of literacy as well as the many, many subskills of being able to clearly articulate the words together boggle my mind. It is breathtaking and miraculous that any of us can do it. It's Olympian in its valor for people like Patrick. Patrick has always loved music and performing and in third grade I decided to sign him up for a two week summer class that included a mini-performance of the Jungle Book at the end. It was an edgy decision but I thought he would love it. He did. He took the script and read and reread it over and over at our house. He sang the songs, practiced the dance moves and dreamed of his moment on stage. When the time came and he took ahold of the microphone I held my breath. God bless his teacher...in addition to allowing him to sing his song she gave him free reign to make monkey sounds afterwards. Of course, he complied with gusto! "Oooo, oooo, eeee, eeee" never sounded so beautiful! All I could think of was Karen. Here he was, getting the opportunity to be on stage and perform when just a few years earlier he could barely be understood. Her hard work, her expertise allowed his dream to come true. and it should be, it should be, it should be like that...Karen is the reason Patrick is able to sing and perform and say his lines. She gave Patrick his voice and there is not a day that goes by that I'm not grateful for that gift of grace: a boy's voice and a chance to dream out loud! Thank you dear Karen! I remember reading that T.S. Eliot thought that April was the "cruelest month" and I remember thinking that whatever crap he was dealing with must have all gone down in April and that for me, forever, May would be the "cruelest month". May 16th, 2002, Patrick was diagnosed with Acute Lymphoblastic Leukemia. I was by myself with Patrick at Kaiser and Dr. Jolly (I told you May was cruel) looked me in the eye and told me that for sure Patrick had leukemia, definitively, no wiggle room. I remember collapsing to the ground and sobbing uncontrollably. I truly couldn't wrap my head around it. How? Why? A toddler with leukemia? NO! What gave me pause wasn't the tenderness and gentleness of Dr. Jolly or the nurses it was two little hands touching my shoulder and rubbing my back. Patrick was comforting me! As usual. It gets a little humbling to have a teacher patiently show you the way with the smallest of gestures with the tiniest of hands. I stopped crying and listened. It turns out that Dr. Jolly had not given me the death sentence that I believed it to be. Patrick's type of leukemia had a good "cure" rate and he had some good signs. Dr. Jolly believed that Patrick would be finished with treatment by the time he began kindergarten. He would walk through the school doors cancer free. I told Dr. Jolly that he was Moses and I was going to follow him through the desert. If he knew the way out, I would stick close and hang on his every word. The only problem: the desert would be a three plus year long journey. We would go through valleys of darkness unlike any other. We would walk alone. We would be afraid. We would wonder if there really was a way out. We would doubt Dr. Jolly and dream of running way. There is no way to describe a time like that in your life. Looking back, I know I was forever afraid of the many bad things that could happen...a bad test result, a complication, a rogue virus that attacks an immuno-suppressed child, a bizarre reaction to the many, many medicines...and I lived on that edge. When you are living with someone who is fighting for their life, all of the superfluous details of life seem unnecessary and silly. I remember my mom asking me about Christmas gifts and just wishing I could focus on details like that. Instead, I had to pay attention to Patrick's body temperature, his intake of fluids, his food, his meds and his many appointments. Worry always at the core. Learning to let go and know that you can control none of it was my constant lesson. I tried to learn it. I am better. Intellectually I know the senselessness of worry and I try to talk myself off the cliff, but my heart does a good job fluttering away. As May came around again in 2003, I would cringe as the day of Patrick's diagnosis would take its place on my mental calendar. I would go into a funk. The world was cloudy and gray. May 16th was destined to be a bad day. I tried to have a better attitude in 2004. Patrick was clearly surviving and doing well. He was still on chemo and still on monthly appointments and still very fragile but May 16th shouldn't bring me down. The anniversary came and went with gray and sadness lingering. May of 2005 should have been sunny and bright. Patrick was scheduled to have everything completed in August of 2005, just in time for kindergarten! But, he had a set back and the desert seemed hot, dry and inescapable. May 16th made its mark on my calendar and seemed to taunt me and jeer. It was official, May was the cruelest month. Happily, Patrick completed all treatment in August of 2005! We celebrated! We counted our blessings! We held our breath. 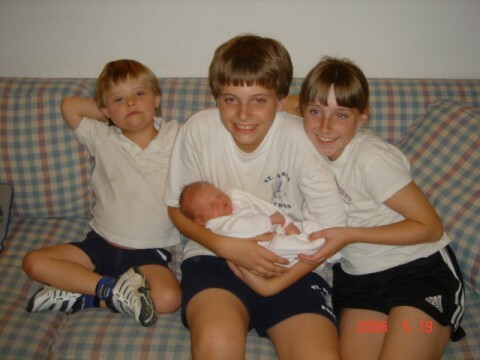 In September of 2005, I found out I was pregnant! At 41, I didn't believe the pregnancy would last. I was convinced the odds were against us. But, I went in to my first appointment with John in October and watched the ultrasound. There was a little hand and it was waving. I kid you not. That little miracle was not to be denied. We found out the due date. I still get chills: May 16th, 2006. In my heart, I wanted to believe that we could love May again, but I just wasn't sure. A lot of heartbreak had happened in May. Could it really be so full of life and love? Could it be possible that a huge blessing awaited us in May? Oh YES! Welcome Baby Caroline! Baby Caroline Claire graced us with her sunshine on May 17th, 2006. She needed her own special day! She has been such a blessing and a ray of hope in our family it is indescribable. Now, when I turn the calendar, I smile. May is not only a rockin' month...it is sunshine, flowers, garden scents and baby smiles. It is happiness, joy and beauty. It is grace in the flesh! We made it out of the desert. Thank you Dr. Jolly. Thank you universe. Thank you! Most especially, thank you sweet Caroline for gracing our lives.